In an address to the “ministers of the world of culture,” given in 2008, Benedict XVI recalled the central role monasteries played in the development of Europe: during a time of general upheaval, Benedict of Nursia (480‒543) established a “stable” place wherein men could come and pledge their lives in toto to a single task, namely, quaerere Deum, the search for God. As he explains, in seeking God, the monks also found a new source of human creativity. The extraordinary focusing of human existence in the monastic life ought not to be interpreted as a flight from the world, as superficial judgments often suggest, but rather as an opening up of the world in its deepest meaning. Created for no other reason than as a definitive expression of God’s goodness, his gratuitous love, the world flourishes as world in giving glory to God. The former pope praised monasticism, in his address, not simply for the service rendered to the Church, but specifically for the great and abiding fruit it has borne as a generator of culture. It is in this context that, after highlighting the contribution to spiritual culture in the beautiful forms of contemplative prayer, centered on the Word, Pope Benedict drew attention also to the monastic expression of material culture: the monks not only praised God in the singing of hymns, but also in manual work. The Benedictine motto is ora et labora. What seems at first glance, perhaps, to be a trivial point turns out to have a profound significance, both when we consider it in light of pre-Christian conceptions of work and in light of contemporary notions, the view of work in our “post-Christian” world. 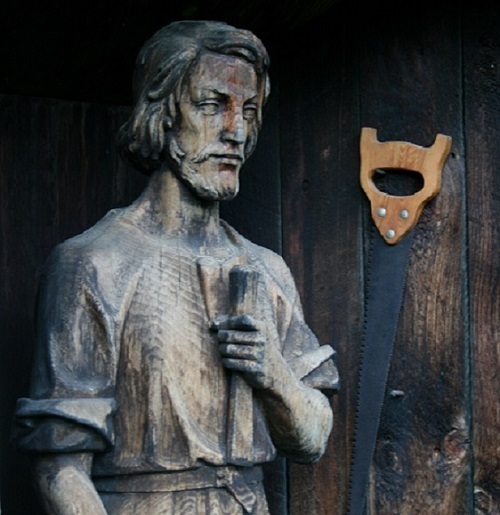 The Benedictine motto ought to be understood as a statement concerning the very meaning of work: to affirm “labora” as an essential part of the monk’s mission is to say that, in addition to all of the other “benefits” it makes possible, human labor offers a way of seeking God. In other words, work represents a specially designated place of man’s encounter with the world’s Creator and Redeemer. What exactly does this mean, and why is it important, particularly for us today? In the Greek world, manual labour was considered something for slaves. Only the wise man, the one who is truly free, devotes himself to the things of the spirit; he views manual labour as somehow beneath him, and leaves it to people who are not suited to this higher existence in the world of the spirit. The Jewish tradition was quite different: all the great rabbis practised at the same time some form of handcraft. It is important to reflect on this contrast, and see how Christianity not only follows the Jewish tradition in granting a special sense to productive human labor, as Benedict says, but in doing so takes up a decisive dimension also of the Greek tradition. The most basic reason that the Greeks had an ambivalence toward work, which in some context would reach the point of outright disdain, was not, as one might think, laziness or even contempt for matter. Instead, as philosopher Jean Pierre Vernant has shown, this ambivalence is due first of all to the absolute significance the Greeks accorded to nature. The Greeks did not recognize God as Creator ex nihilo, but rather as the ultimate principle of order, and they saw nature—that is, the given intelligibility, beauty, and goodness of things—as the place wherein divine order culminates. This order is, in fact, so divine that it even presents a constraint on the activities of the “gods” themselves. When the Greeks called the world “kosmos,” meaning “jewel” or “ornament,” they were setting into relief both this essential order and its divine provenance. Divine order, the presence of the gods, shines forth in the resplendent goodness that inheres in things, and this implies that the noblest human act is the aesthetic gaze. We commune, so to speak, with God when we contemplate the intrinsic goodness of things, their radiant order, the splendor of their truth. The perfection of this radical affirmation of reality explains the ambiguity of work. The act by which, instead of beholding the beauty of things, we change them, we intervene in their natural order in order to redirect them, so to speak, to the service of some extrinsic need, cannot fail to appear as a kind of desecration. The Greeks were never able finally to excise from work, and most specifically the work associated with human ingenuity (technē) and creativity (poēsis), the shadow of hubris, and even blasphemy. The mythological origin of the human arts, the “technai,” is Prometheus’ theft from the gods. Work, in other words, has an ineluctable tragic character, even, or perhaps especially, when it exhibits the artisan’s exceeding skill. It is interesting to note that agriculture, while entailing a certain drudgery and unrelenting uncertainty, and thus falling short of the divine ideal of contemplative leisure, nevertheless did not betray the same ambiguity, for the Greeks, as technē: in agriculture, human activity is not so much an intrusion into nature as it is a cooperation, an effort that serves principally to allow nature’s own generative forces to reach their most excellent discharge. The Jewish people had a similar esteem for agriculture. In their case, however, this esteem arose not most basically from a recognition of the intrinsic goodness, the essential divinity, of nature, but from the command given by the almighty God, the Creator of all things in heaven and on earth. When God created Adam, he placed him specifically in the garden in order to tend it and to keep it. Like all created living things, man receives the commandment, which is at the same time a blessing or conferral of creative power, to “be fruitful and multiply,” a commandment he lives out in the one-flesh union of man and woman. But beyond this general prescription, man is given another injunction to fruitfulness, which is specific to him, namely, the command to have dominion over the things of the earth. Agriculture, which is an activity that gives form to the natural world in such a way as to enable it to bear fruit, is obviously a paradigm of such dominion. The special status of agriculture becomes apparent, moreover, in the fact that the Covenant God makes with Abraham, which forms the central identity of the Jewish people, coincides with the gift to them of the Promised Land. We see in all of this that man is offered a special relationship to God, so to speak, in the medium of labora. If God commanded Adam to till the garden, it was not because God was incapable of putting order into vegetation himself, or even because man would otherwise have to starve (there is no suggestion in the text that tending the garden was necessary for the production of food); instead, work is given to man principally as a gift, as a particular way to commune, so to speak, with God, by imitating his own absolute creativity, his perfect work. Because, however, the special significance of agricultural work, for the Jews, stemmed not first of all from the intrinsic goodness of nature but most basically from the transcendent power of God’s command—or, to put it more adequately, the goodness of agriculture is due to God, not qua sanction of natural order, but qua almighty Creator—the Jews, unlike the Greeks, were able to affirm unambiguously the goodness of crafts and trades. In a certain respect, such activities are more divine than agriculture precisely because in their transformative intervention into nature they more closely image the creative power of God. His ex nihilo creation, in other words, paradoxically takes the form of a response to the world’s intrinsic goodness and beauty. By the same token, God’s perfect ec-stasis, his productive bringing about of something genuinely other than himself, something “outside” of him and his nature (creation is understood as an opus “ad extra”), coincides with his remaining “contemplatively” inside, at rest within himself. Being perfect within himself and being generative of something other are both essential expressions of the goodness identical with absolute love. Such a view of creation, of course, can be sustained, finally, only in light of a notion of God as Trinity, which is to say of a God for whom relation to an Other is not opposed to being in oneself. It is indeed the Trinitarian God who is manifest in Christ’s incarnation and redemptive death on a cross: Here is God, who can hand himself over so perfectly to his other as to be one Person in two natures, and can hand himself over so perfectly as to sacrifice the life that belongs to his nature—all without ceasing to be God. These are central Christian mysteries, and their rich significance could fill more books than the world can contain. But we recall them here specifically in order to consider what they imply for the meaning of work, both in relation to the ancient world and our own contemporary age. To put the matter somewhat oversimply, the Greeks recognized the intrinsic goodness of things, the fundamental beauty of nature. For that very reason, however, they were ambivalent about work, in which things were, so to speak, brought “outside” their nature to serve non-natural ends, and the worker, too, subordinated his activity to the service of something outside himself (both in the sense that his activity results in a change in something other than himself and in the sense that he typically makes things to sell to others). Both of these dimensions stand in contrast to contemplation, in which things are beheld in their natural goodness and the beholder enjoys the perfect immanence of the activity: contemplation is good simply for its own sake, and not because it fills some external need. The Jews, on the other hand, affirm the value of work, the nobility of service, above all obedience to God’s Law, and recognize, in the light of God’s creation, the meaningfulness of genuinely productive activity—but not in the first place because any of this is simply good by its nature. It is interesting to note that, unlike the Greeks, the Jews did not have a practice of contemplation—strictly speaking, keeping the Sabbath has a very different principle from that of Greek scholē. The Christian affirmation of ora et labora, contemplation and action, represents a kind of unity of these two traditions. As we see in Dionysius’ interpretation of creation, an affirmation of God’s absolutely productive activity, his giving rise to something truly other than himself, coincides with an affirmation of the intrinsic goodness of the world in itself; indeed, creation as perfect generosity in a certain sense absolutizes that intrinsic goodness. At the very same time, because this absolute goodness coincides with genuinely productive activity, the Christian mysteries reveal that even the movement out beyond one’s nature, to the point of self-sacrifice, is not an abandonment of intrinsic goodness, but a gratuitous—i.e., grace-full—fulfillment of it. Both the affirmation of contemplation and the sacrifice of work give glory to God. Let us consider this point more concretely. In the Christian vision, there are two ways a tree can be good. There is first its immediate, natural goodness, as when it displays itself in a forest or a park, in the magnificence of its stature, manifesting the beauty of its color, filling the air with its scent, perhaps offering food to squirrels or a home to birds. Then there is a second, “artificial” goodness, when it becomes wood for a fire, for a chair, for a door of a cathedral. These are radically different kinds of goodness, even to the point of being mutually exclusive in any particular case (to enjoy the goodness of the tree qua firewood requires the elimination of the tree qua living organism), and yet there is no contradiction in affirming both. Indeed, there is a deep connection between the two, which allows one—in fact, ultimately compels one, if one is to love properly—to love trees in both ways. To love a wooden chair does not oblige me to hate the tree in the forest. To the contrary, the more deeply I love a wooden chair, the more interested I become in the kind of tree out of which it is made, the quality of this sort of wood in comparison to the wood of other types of trees, where such trees grow, what they look like—and feel like, and smell like, as trees. If such a love is a true love, which is to say if it is such a love as to call me to give myself over to it with a certain seriousness, I may become a carpenter. In this case, I involve myself in the reality of trees, of wood, in a genuinely corporeal way, and in a way that makes a claim on a significant part of my existence—or perhaps better on the whole of my existence in a certain respect. Mastering this craft requires a great deal of time and a discipline, or in other words a learning that is at the same time a training of energies, an inscribing of certain practices, so to speak, into my very flesh. I have to come out of myself, in what can be a toilsome and even painful activity, in order to work with the wood. As contemporary writer Matthew Crawford has shown, such work is not the dialectical opposite of contemplation, but rather represents a kind of contemplation of its own, insofar as it offers a special and indeed irreplaceable way of knowing things, beyond the knowledge of concepts alone. This is a properly intimate knowledge, and a fruitful one. In this “act of knowing,” a tree is lifted out beyond its natural goodness to put that goodness at the service of some end not immediately inscribed within the boundaries of its nature. It is not wrong to see this transformation of a tree into wood, and then into a chair, as an analogy—distant, to be sure, but no less real—of self-sacrificing love, both on the part of the worker and on the part of the tree. Recognizing it as such brings one to recall the natural goodness of the tree that precedes the work, to see that the transformation is a kind of fruit of the tree’s natural perfection, a fruit in which the tree remains somehow present. The work is thus a joining together of two movements of self-transcendence: man the worker spends himself in a form-giving activity, and the tree is thereby taken up and made into something new. The chair, which results, is more than man and more than tree. It is a new reality that bears the traces, as it were, of its two sources. In bearing witness to what is analogous to the surprising goodness of self-sacrificing love, at the deepest level, such work makes manifest the ultimate Source, the love of God himself. In doing such work, whether one is conscious of it or not, one is seeking God. The deep pleasure of the work is a sign of this. To be sure, one works, not simply to enjoy a special sort of intimacy with creation and thus to commune with God, but perhaps most obviously in order to produce things that are useful for human existence; moreover, even such production for the most part serves a yet more extrinsic end in providing wages for the laborer, and profits for the merchant. But these further ends do not in principle require the elimination of the fruitful encounter we just described. Instead, these more extrinsic ends can be affirmed as implications, necessary but subordinate, of the principal good that is the work itself. When we turn, in the light of this description, to look at the world of work in the Christian middle ages, with the monastery at its center, we cannot help but be struck by the sheer abundance of creativity, which is of a specifically organic sort. On the one hand, in part by virtue of the special organization of work in the monasteries, the high middle ages were marked by a surge in what we would today call technological innovation, both in “machines” and in working methods, and on the other hand, at the same time, we find a celebration of the gifts of nature, precisely as natural, in the multifarious expansion of “material culture.” One of the most distinctive dimensions of medieval life is the great proliferation of crafts and guilds. These represented not merely instruments of economic production, but at the same time they entailed ways of life, formation in a particular ethos, with its own codes of conduct, its rituals, traditions and organs of their transmission, not unlike the sacral orders of the Church and the monastery, all at the service of making good things . . . out of good things. This abundance of creative life appears against the background of the abiding fundamentality of agriculture: “Tilling the garden” and keeping the herds and flocks was the bedrock of Feudalism (from the Latin “feudum,” land granted to be held as a benefice), which was the defining economic form of the middle ages. A beautiful expression of the intersection of time and eternity, world and God, in medieval work can be found in the illuminations that commonly graced the pages of the Books of Hours, by which lay people lived the form of holiness according to their own state of life. Whatever the precise historical origin of the modern view of work, there can be no doubt that, at its very heart lies an elimination of the generative encounter between man and world under the sign of beauty, goodness, and truth. The developments in the practice, purpose, and organization of work beginning in the mid-19th century—the industrial revolution, the institution of factories and methods of mass production, the radical sub-division of labor, the emergence of finance, marketing, and management as distinct fields of work, the radical sub-division of these fields, the commodification of land, labor, and money itself, the globalizing of both labor and consumption, the creation, and then the normalization, of large-scale industrial farming and agribusiness, the technological replacement of labor, and indeed the technological replacement of management—all share a common principle and goal: the complete instrumentalization of work, and so the oblivion of its intrinsic goodness. This instrumentalization, by necessary implication, tends to engulf not only the workers, which is obvious, but also the consumers of the fruits of labor, which is less obvious. To be sure, work has always had an instrumental value, but as we suggested above, in the healthiest instances the “external” ends of work are recognized as fruits, and therefore as requiring investment, so to speak, in the activity itself as an integral whole, a good already in itself. We recall that God gave man work first of all as a gift, and not as a mere means of survival or to accomplish what God was impotent to do himself. In the modern world, if a technique or technology could be discovered that would reduce the cost of labor—both by eliminating the number of laborers necessary and, even more fundamentally, cheapening its value by radically simplifying its content—and at the same time increase the productivity, it would make no sense at all not to implement it. In fact, one could argue with some plausibility that it would be irresponsible not to do so. But note what is implied here: this judgment assumes that work, as an activity whereby man as an integral reality encounters a thing in the world as an integral reality, is not itself a good, one that would weigh in the scale against the increase in efficiency. At our more reflective moments, we might speak of the “human cost” of, say, the technological replacement of labor, but even in this case what we tend to mean is nothing more than the unemployment it produces in its wake. In other words, we express a regret that work as a mere instrument of production has evicted work as a mere instrument of wage-earning. Without in the least dismissing the significance of earning a living or of producing necessary goods, we need to see that this reflection betrays a total oblivion of work as good, as a privileged place in which man encounters the world, in which he grows by contending with something real, something that demands full-bodied attention, in which he receives in gratitude something that possesses its own beauty and goodness, and, through his own efforts, becomes in a perhaps surprising way even more beautiful and good. A machine, or in any event a system of machines, can turn a stack of wood into a hundred times more chairs than a carpenter can produce by his own hand. But if we say that the exchange of the one for the other is an unqualified good, we are ultimately denying, however unwittingly, the goodness of creation, and therefore the existence of God. This denial of God remains the case no matter how much we might go on to dedicate the profits of our business to charity, treat our customers with personal attention, bear heroically the competitive costs of remaining honest in our book-keeping, or even say our prayers while we operate the machinery or before every “team meeting.” None of these practices touch the meaning of work; they become so many efforts that vainly seek to compensate for having evacuated God from the heart of the world. We all recognize what Harry Braverman called the “degradation of work” in the modern world, and we all suffer from it in some respect, some of us quite directly and severely. One manifestation of this degradation is the radical mobility of modern labor, both in the geographical sense that work is sent to its cheapest locale around the globe and workers are prepared to follow wherever it goes, but also in the anthropological sense that it has become normal to change one’s career multiple times over the course of one’s life: this shows that the career at issue is easy enough to pick up quickly, without much self-investment, which means in turn both that it is content-poor (and so not humanly fulfilling) and that the workers in this career are more or less interchangeable. The degradation of work and the suffering it causes has provoked efforts in various quarters to remedy at least some aspects of its implications. On the one hand, there are movements for justice, calling for improvements in working conditions, protections for workers’ rights, growing support for “fair trade” business practices. On the other hand, in response to the nihilistic ethos of the modern corporation, the absence of meaning in so many lines of work, even those considered privileged or even prestigious, one finds attempts to make the work-place more friendly, more fun, more flexible and accommodating. In the end, however, genuinely human work is not simply work that has been rendered less burdensome or more just (though of course this latter quality is indispensable); work is genuinely human when it becomes a concrete expression of man’s ultimate vocation. Life coaches encourage people to forget about money and pursue a career that involves work that they “love.” The use of this word might be thought of as an echo, no doubt unconscious, of the great Christian tradition of work. But the word in the contemporary context means something quite different from what the word might mean, for example, to a medieval stone mason. From a career counselor, the word is basically psychological, and means more or less subjective pleasure or self-fulfillment: this is work I can take a certain delight in doing, and it allows me to use my talents. However valuable such things may be, they are fundamentally different from love as a response to objective goodness, a response that includes pleasure and fulfillment, but gathers these up into the form of an objective bond. To be sure, this sense of love as bond is not especially romantic, since it directly implies some suffering, the bearing of what is heavy precisely because it is substantial. But nothing insubstantial can be truly meaningful. Substantial love, for all of the suffering it brings with it, is a celebration of the goodness of the created world in its ontological density, a celebration that is altogether bodily, demanding the investment of one’s whole person for the sake of something that has intrinsic value, becoming fruitful for oneself, one’s family, and one’s community. The monastic existence that Benedict XVI recalled as a wellspring of culture is characterized by substantial love because it is characterized by “permanence”: the Benedictines took a vow of stability, all monks enter this existence through the pronouncement of perpetual vows, they fill their time with a consideration of things eternal. It is as part of such an existence—or in forms of life analogous to it—that work becomes a quaerere Deum, and thus a fully human expression of Christian love. Jean Pierre Vernant, “Work and Nature in Ancient Greece,” in Myth and Thought Among the Greeks (New York: Routledge and Kegan Paul, 1983), 248‒70. The classic expression of this tragic character is the famous “ode to man” in Sophocles’s Antigone, lines 332‒75. See Herbert Applebaum, The Concept of Work, Ancient, Medieval, and Modern (Albany: State University of New York Press, 1992), 37‒44. See Arthur T. Geoghegan, The Attitude Towards Labor in Early Christianity and Ancient Culture (Washington, D.C.: The Catholic University of America Press, 1945), 59‒89, esp. 62. This is not to say that the goodness of the world is in any sense denied—quite the contrary, the creation narrative in Genesis affirms the world’s goodness unequivocally: “And God saw everything that he had made, and behold, it was very good” (Gen 1:31). The point is that it is good as a result of God’s creative power rather than as an absolute “given,” which is how it tends to be seen by the Greeks. As John Paul II’s encyclical Laborem exercens observes, work is a uniquely human activity. The encyclical likewise explains that the “dominion” man is to have over creation must be interpreted, not as an absolutized power, but a creativity that is responsive because it first presupposes man’s receptivity to the God-given meaning and value of the natural world. Gen 2:2‒3 refers 3 times (a perfection number) to God’s creation as an accomplished “work” (“melachah,” as opposed to the more general term for work, “avodah,” which can be translated as “labor” or “toil.” “Melachah,” the word exclusively used for God’s work, is a creative, productive, or perfective activity). It is interesting to note that, in Scripture, the handicrafts are especially honored by God in the construction of the Tabernacle: see Geoghegan, 65. To say that the Jews esteemed the crafts and trades, however, does not mean that there were no prohibitions against particular trades: see Applebaum, 182. The connection between a robust notion of creation and a positive conception of work is presented quite clearly by George Ovitt, Jr., The Restoration of Perfection: Labor and Technology in Medieval Culture (New Brunswick: Rutgers University Press, 1987). Often referred to now as “Pseudo-Dionysius,” this anonymous author was likely a monk who lived around 500 AD. He took his name from the Greek judge who was converted by St. Paul by the famous sermon the latter delivered at Mars Hill. See Acts 17:34. Dionysius the Areopagite, The Divine Names, trans. C.E. Rolt, 106. It was the Jewish philosopher Philo who first used the language of contemplative leisure to describe the keeping of the Sabbath, but of course he was deeply influenced by the Greek philosophical tradition. Note that, already at this level, there is an analogous extension of the meaning of goodness: being food for squirrels or a home for birds is already a movement beyond the tree’s immediate nature, but it is nevertheless a movement beyond that takes place within nature. See Matthew Crawford, Shop Class as Soulcraft: An Inquiry into the Value of Work (New York: Penguin, 2009). Max Weber, The Protestant Ethic and the Spirit of Capitalism (New York: Penguin, 2002). Harry Braverman, Labor and Monopoly Capital: The Degradation of Work in the Twentieth Century, 25th anniversary edition (New York: Monthly Review Press, 1998). Keep reading! The next article in this issue is, How Your Moleskine Can Bring Out Your Humanity: Why Matter Matters, a book review Jonathan Elliot.